A task that you are focused on getting done. If you loose focus, accidents happen -- such as hitting your finger with a hammer or stepping on something yucky. When focused, you get things done quicker with better quality. It is important to only focus on one task at a time as our brain isn't wired to multitask [inc] but better at doing one task at a time. So stay focused on one task at a time always. A thought that you are focused on. Since we can't multitask, we can only focus on a task or a thought but not both at the same time. When I am deep in thought, everything else just fades away. Being able to focus on a thought allows me to come up with better ideas and solutions to a problem and get a 360 view. Goals/plans that you are trying to accomplish. There are so many distractions through out the day, if you are not focused on the end goals, it is easy to get lost. 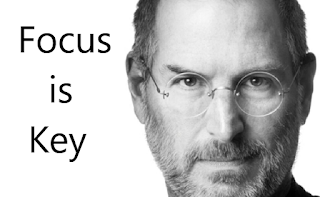 Great leaders, like Steve Jobs, have great focus on what needs to be done and understand focus is key [techcrunch]. By focusing on all 3 aspects, not at the same time of course, you can get the relevant tasks done quickly with high quality in a good way. What's even better? Collaborate with your peers to get more done and find even better ways -- many brains are better than one. In terms of improving focus, I think it is just practice and discipline. Meditation helps [gaiam] too. This is part of the Great Leadership and Superpowers blog series.